The Sewing With A Plan rules for the contest at Stitcher’s Guild (January to April 2019) have been posted. I have several sides to my sewing personality. The theory side : I’m a pattern nerd and love knowing how patterns work and how garments are constructed. I read pattern making and sewing instructions for fun (yes, not many people do that 😀 ) I also love sewing videos for how clear they make technique, but don’t binge watch them as I tend to want to make the item and I have a big enough pile of half-finished projects without their help ! The newbie side : When I’m learning something I love detailed instructions and get stressed if I have to ‘wing it’. But once I know what to do, I can merrily ‘think outside the box’. – I wear a ‘uniform’ and mainly one silhouette – frilled blouse, slim pants, layer (some variety here), padded vest in deep winter. 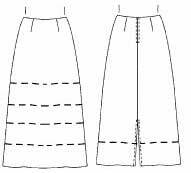 – my sewing style is ‘one pattern many looks’. I have such trouble getting things to fit, it’s easier for me to start from a basic pattern and add variants, rather than exploring all the shapes and styles that professional pattern designers offer us. The ‘One pattern many looks’ contest is also coming up at Pattern Review, starting November 15. I allow myself more freedom with pattern hacks than they do, especially adding/removing closures. – suggestions for simple starting point patterns. 9 variants of a TNT layer. The SWAP Rules work equally well for someone who loves to make each garment from a different pattern, or even all 11 items as different types of garment. What freedom ! The main limits this year are in number of colours and prints. I wear mainly quiet neutral colours and prefer texture to print, so that’s no problem for me, but some people have difficulty with these limits. similar to the Liesl & Co Recital blouse. such as the slim version of the Merchant & Mills 101 trouser. This very simple shape has almost infinite potential for variations : every type of fabric, embellishment, simple pattern hacks including sleeveless and open front. The paper pattern for this tunic comes in 2 size groups. The pdf pattern with Sonya Philips’ Creative Bug tunic class has all 8 sizes. Well, what’s important is the simple general concept of this tunic pattern rather than the specifics. The pdf pattern has some fitting oddities. Supposed to have 2″ underarm ease, but be sure to check the finished width and length before cutting. There are many simple patterns like this, but most are rectangles and as I’m very pear shaped I like one with sloping sides. This one is quite flared. Look at your favourite stores and designers for ideas about style elements, silhouettes, proportions. But I find it easier to start with sources that tell you how to make the changes to a pattern. I’ve written several posts about simple variants of a basic style. You haven’t got to do a formal pattern making course, or work through one of those daunting college textbook pattern making tomes, to do these. The next posts show many variations but don’t include pattern change specifics. And scroll down my pinterest boards for style elements. People write whole books on simple changes to basic patterns. 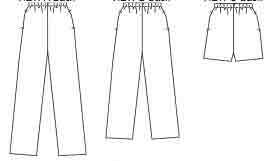 Rusty Bensussen – Making a complete wardrobe from 4 basic patterns (patterns to scale up included, see later). 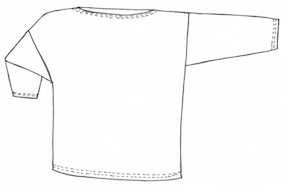 Borrow & Rosenberg – Hassle-free make your own clothes book (make your own patterns). Also ‘Son of hassle-free clothes’ with more advanced techniques. Bottom & Chaney – Make it your own (no base patterns in this one). The specific suggestions in these books do look ‘over the top’ to modern taste, but great fun and full of ideas. Many of the styles make us laugh now, but most general pattern making and sewing techniques are still the same. 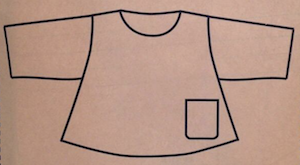 15 years after the Bensussen book, the book Easy Sewing the Kwik Sew Way had many variations on slightly more complex patterns (full size traceable paper patterns included) : a shirt-blouse, elastic waist bottoms (2 skirts and pants), plus a knit tee. Most book writers and video presenters make their changes to intermediate level patterns – shirts, fly front pants, sheath dresses. . . Some modern books and videos about simple pattern changes are linked in my post about simple pattern altering mentioned before. There’s a new book, The Savvy Seamstress by Nicole Mallalieu. This does not include base patterns, but is full of instructions for pattern making and sewing to change the style elements of existing patterns. Here are some ideas for very simple starting point patterns, with an emphasis on pattern lines and books that help with variations. These ultra-simple patterns have no darts for shaping, no buttons or zips for getting into a close fit, and the sleeve can be sewn flat. Simple silhouettes with few style elements, so you’re free to add your own. Bensussen gives measurements for drawing the patterns on a 1″ grid. 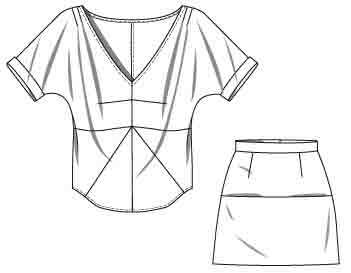 The basic top pattern is very loose fitting, so your body shape doesn’t much matter (54-56″/c140cm at underarm). 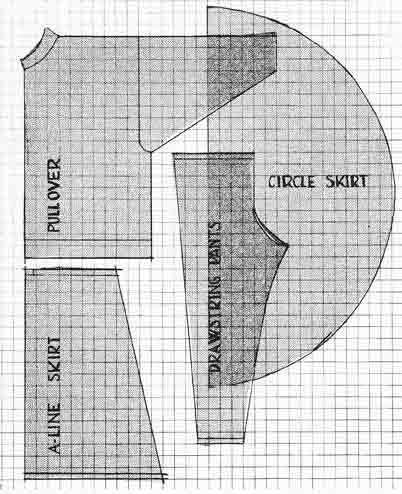 The ready-made patterns from 100 Acts of Sewing have the same spirit with modern proportions – Tunic No.1, bias Skirt, Pants No.1. Tunic good for the pear shaped. Paper patterns from Sonya Philip’s on-line shop. 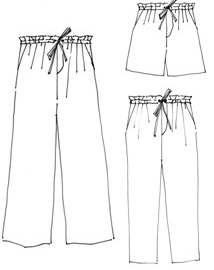 Pdf patterns for tunic and pants included in her Creative Bug classes. Those classes include videos about making variations for each pattern. There are photo tutorials for more variations on her site. She also has base patterns for tee and leggings. If you’re inverted triangle body shape, perhaps use some of the free downloads from Tessuti. These top patterns are simple shapes and makes, but have no help for beginners or guides for variations. One example, the Mandy Tee. For rectangle body shapes there are several options, here are some. The master patterns for top and pants from FitNice have the same simplicity, and with a big focus on pdf and video instructions for variations. 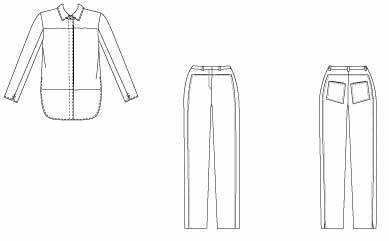 Fit For Art have master patterns for jacket, tee, pants, and many supplementary patterns with pattern pieces for other styles. 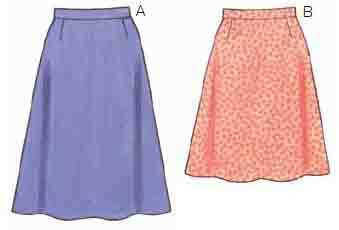 If you prefer Big 4 patterns, a couple of basics are Butterick 5948 and McCall’s 6465. Many views in one easy top/dress pattern. 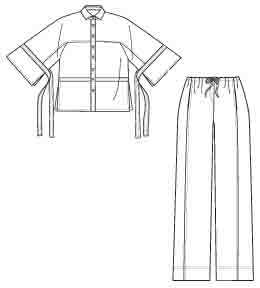 Add elastic waist skirt and pants, such as Butterick 3460. 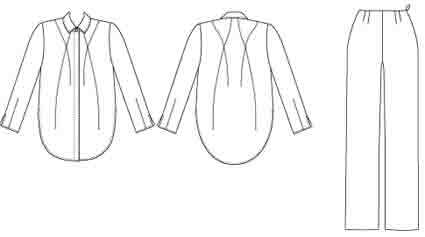 Those patterns are all a simple fit and simple sew because they are ‘dartless’ and loose fitting. Getting a good close fit is not a quick and easy process for many of us, and moves sewing up to a different level involving darts, set-in sleeves, and closures such as zips or buttonholes. People who are hour-glass body shape can of course do pattern alterations too, but a flattering base pattern might be more shaped than the ultra-simple patterns. 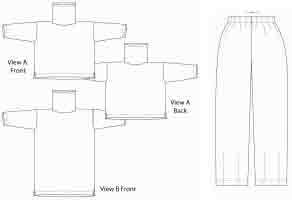 Sure Fit Designs master patterns help with some fitting issues, and have detailed pattern making instructions for variations. For other intermediate patterns, see the section above this on modern books and videos. And writing this has reminded me of 100s of options. Having at last made my final Index page 5 which lists posts on co-ordinates and capsules, here are some other capsules which could be the starting point for a basic wardrobe. There must be thousands of attractive inspiring outfits on the web. Apart from all the style blogs, Polyvore is set up to devise them, and there are multiple Pinterest pages. A capsule is more than an outfit – a small group of co-ordinated clothes which can be interchanged to make several outfits. Perhaps (2 tops, 2 bottoms) to make 4 outfits. 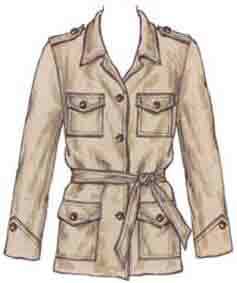 Or (jacket, shirt, 2 tees, pants, jeans) which together make 12 outfits to cover many situations. Here’s my post on basic capsule options : building your wardrobe in small groups. Start with one capsule and simply add another similar. Judith Rasband’s college textbook Wardrobe Strategies for Women bases wardrobe building on capsules. Once you set up the basic pieces, every time you add a co-ordinating item it can double the number of possible outfits. See my post on the power of the boring. There’s a discussion on minimalist wardrobes at You Look Fab. If you find it easier to take inspiration from specific capsules or to react against them, rather than devising your own starting point, here are some of the many possibilities. Some are specific enough to show a particular style. Some are just numbers of garments. Though even numbers have style implications. Most for example include 0 or 1 dress – no use if you love dresses. Some of these groups just count clothes, some count both clothes and accessories. If you’re allowed infinite numbers of accessories, you can make infinite numbers of outfits with very few clothes, see the Uniform Project. Here’s an 8-item weekend travel capsule consisting of 4 garments, 4 accessories. 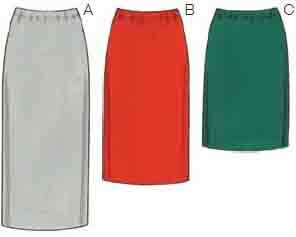 Or here’s a group of 6 garments – jacket, 3 tops, skirt, choice of 2 pants : The Kit (click on the photo for more detail about each style). 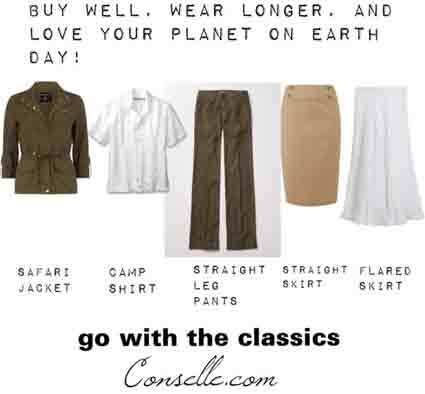 In style contrast, Perfectly Packed has a classic business wardrobe of 8 garments, which can be copied easily using two wardrobe patterns, see my post on classic style. His 10 items are clothes only, add accessories. For example variants of this, see the middle of my post on your personal wardrobe plan. And Imogen Lamport’s thoughts on this list and her own version. Imogen has several suggested capsules for different lifestyles, mostly about a dozen items. Here’s her post on a capsule wardrobe of 12 items. And here’s her post on combining colours and combining prints, very ‘this season’ co-ordination. Elizabeth (ejvc) suggests a 12-item group, and prices it (about $225) for sewing. If you want natural fabrics, you need to use just one pattern magazine, and mainly black fabric, to get the cost that low. Much cheaper if you’re comfortable in polyester. I would probably use a wardrobe pattern book (see Index page 3), about twice the price of a pattern magazine. has 12 basic items including accessories, plus 8 add-ons : 20 in all. 23 items including underwear and accessories. I still disagree with nearly very word of this, see my post, but many people working in a very classic environment love it. Nancy Nix-Rice builds up from 12 basic garments to 23 garments in all, plus suggestions for minimum accessories. She claims to get nearly 100 different outfits from her 12 garments. See Index page 4 for my posts on her scheme, with links to her lessons, and suggested patterns. Seasonal 6PACs : 24 garments in all, organised in 4 seasonal groups of 6. Here’s a list of relevant posts from ejvc, who started the idea. There’s always a sewalong for the current season at Stitcher’s Guild. Many of Janice’s posts at The Vivienne Files are suggestions for capsules, showing the different outfit combinations you can make. And most of her other posts show how to take a single garment or outfit and make many different looks by using accessories. And here’s a whole pinterest page of capsule suggestions. What about some patterns ? Most of the capsules don’t suggest specific styles. 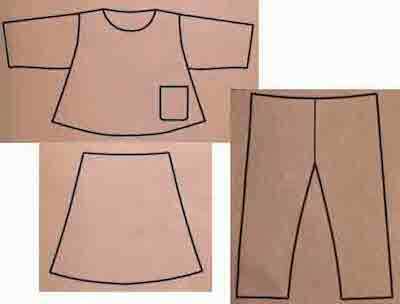 So here are my current personal easy sewing ‘Key 3’ patterns. Sewing Workshop Hudson top and pants, Indygo Junction Origami wrap. Add intermediate sewing skills, and make the Sewing Workshop Tribeca shirt and Indygo Junction Silhouette vest (close the vest up to the neck). My current ‘Vital 5’. In quality fabrics for Relaxed Luxe style. Very different in spirit from many wardrobe plans. 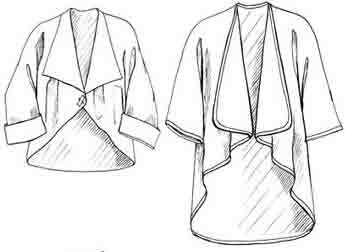 My needs are most like the Sewing Workshop wardrobe, see my post on Linda Lee’s layering wardrobe. I groaned recently about some wardrobe styling advice which suggested what were supposed to be different style capsules, but were actually all variants of blazer, knit top, jeans. As I don’t wear any of those. I’m glad I’ve done all the work on identifying my own style and wardrobe needs, so I can just move on from unhelpful advice. People who love dresses probably feel equally ignored by most wardrobe suggestions. If your personal style is ‘modern classic’ and you feel happy in blazer, tee, jeans, then good luck to you. Prefer different types of top, bottom, layer, or dresses ? Best Wishes to all the people who have to find their own capsule scheme. I think most wardrobe lists need to be adapted to your own personal style, colouring, body shape, lifestyle. Hence my post on your personal wardrobe plan. See Index page 4 on wardrobe plans in general. Also your personal style preferences. And Index page 1 on personal style. There are some links on the other ways to look your best, in my post on So many choices. 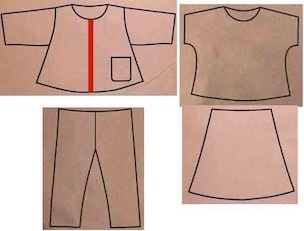 If you haven’t got a good starting point for your own wardrobe group, have a look at patterns that are supposed to take less than 2 hours sewing time – Index page 8. See Index page 5 for comments on co-ordination, and posts which include specific capsules. Starting with a small capsule and building on it isn’t the only way to get a basic wardrobe. 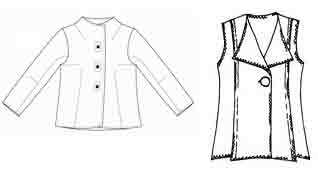 There are many books and websites with wardrobe plans with other approaches – see wardrobe and capsule planning references thread at Stitchers Guild. Each writer has their own scheme. If you still think planning a wardrobe is frivolous, here’s an excellent piece by The Dashing Eccentric. 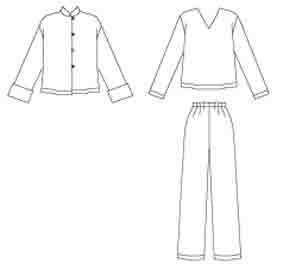 Or have several different small groups of clothes, which co-ordinate within one capsule but not with others. I should think there are very few people who have a wardrobe in which everything co-ordinates with everything else. Would that only be possible if you led a very limited life ? I haven’t got clothes wearable for both sailing and a black tie evening. My clothes are in a limited range of colours and shapes so many, though not all, are interchangeable. Not so with accessories – some of my outfits are enhanced by scarves, some by necklaces.